Carla Kristen Esparza is an American professional mixed martial artist fighting at Strawweight (115 pounds) and the former UFC Women’s Strawweight Champion. She was the first Invicta FC Strawweight Champion.She also competed in Bellator Fighting Championships’ first women’s tournament. Esparza is currently the #9-ranked pound-for-pound female MMA fighter in the world by MMARising.com and the #2-ranked female strawweight according to the Unified Women’s MMA Rankings. Esparza is of Mexican, Ecuadorian and Irish descent. 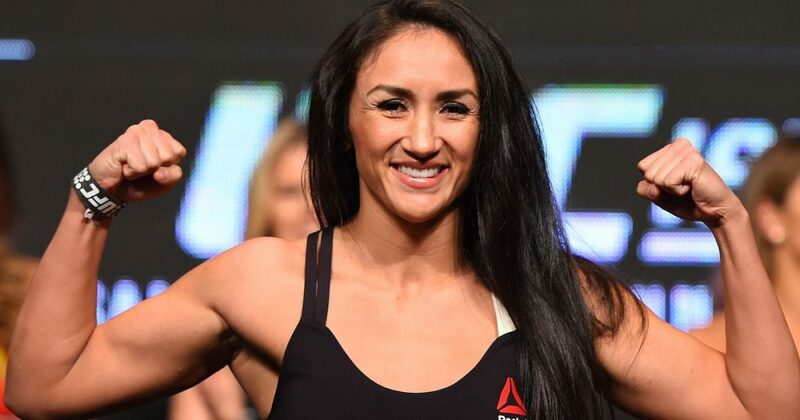 Carla Esparza’s foray into mixed martial arts began when she started wrestling for the varsity team during her junior year at Redondo Union High School in Redondo Beach, California. After winning multiple local and national high school wrestling tournaments, Esparza was awarded a scholarship to Menlo College to wrestle under coach and former two-time Olympian Lee Allen. In 2008 and 2009, Esparza was a women’s wrestling All-American with the Menlo Oaks. While in college, Esparza started training in Brazilian Jiu-Jitsu at the Gracie Academy in Torrance under Rener, Ryron, and Ralek Gracie. She then expanded her mixed martial arts repertoire when she began training at Team Oyama during the summer of her junior year of college. In August 2010, only six months after her pro debut and with just three professional MMA fights, Esparza was called in by Bellator Fighting Championships as a last-minute replacement for Angela Magana, who was forced to withdraw from her upcoming fight due to a foot injury. Esparza was inserted in the bracket of the Bellator Season 3 115 lb women’s tournament at Bellator 24. On just three days’ notice, Esparza’s opponent in the quarterfinal round was the undefeated and then #1 pound-for-pound female MMA fighter in the world, Megumi Fujii. Esparza lost the fight to the heavily favored Fujii via second-round armbar submission. In June 2011, Esparza returned to the Bellator cage and faced fellow Season 3 tournament challenger Jessica Aguilar at Bellator 46. After a three-round back and forth battle, Aguilar defeated Esparza via split decision. On December 2, 2011, Esparza made her XFC debut against Felice Herrig at XFC 15: Tribute in Tampa, Florida. She defeated Herrig via unanimous decision. Three months later, Esparza was scheduled to face Angela Magana at Pandemonium VI for the MEZ Sports women’s flyweight title. Unfortunately, Magana was involved in a car accident on the day of the fight while in transit to the Riverside Convention Center, where the event was being staged. Magana re-broke her back in the collision and was unable to compete in the fight. In May 2012, it was announced that Esparza had signed with the upstart all-female Invicta Fighting Championships promotion. On July 28, 2012, Esparza made her Invicta debut at the promotion’s second event, entitled Invicta FC 2: Baszler vs. McMann, and faced Sarah Schneider on the preliminary card. Esparza won the fight via TKO (punches) at 4:28 of round two. Esparza returned to Invicta to face Lynn Alvarez at Invicta FC 3: Penne vs. Sugiyama on October 6, 2012. She defeated Alvarez via TKO (punches) at 2:53 of round one. Esparza was expected to face Ayaka Hamasaki for the Invicta FC Strawweight Championship at Invicta FC 4: Esparza vs. Hyatt on January 5, 2013. However, Hamasaki withdrew from the fight in order to defend her Jewels Lightweight title in Japan. Esparza was then set to face Brazilian Jiu-Jitsu black belt Claudia Gadelha in the Invicta FC 4 main event, but Gadelha broke her nose in training and was forced to withdraw. Esparza ultimately faced Australian fighter Bec Hyatt for the Invicta FC Strawweight Championship. Esparza won the fight via unanimous decision to become the first Invicta FC Strawweight Champion. Esparza agreed to defend her title against Ayaka Hamasaki at Invicta FC 6: Coenen vs. Cyborg on July 13, 2013. However, on June 4 she withdrew from the fight due to a knee injury. On December 7, 2013, Esparza was set to defend her strawweight title against Claudia Gadelha at Invicta FC 7. However on the day of the event, Gadelha was taken to the hospital due to a bacterial infection and the fight was canceled. Esparza vacated the title on December 11, 2013 to participate on The Ultimate Fighter 20. On December 11, 2013, it was announced that Esparza was signed by the UFC along with ten other strawweight fighters to compete on season 20 of The Ultimate Fighter which crowned the first ever UFC strawweight champion. Esparza was the overall number one seed in the tournament. She faced Angela Hill in the preliminary round and won via submission in the first round. In the quarterfinal round, she faced Tecia Torres and won the fight via majority decision. In the semifinal round, she faced Jessica Penne and again won by unanimous decision. Esparza competed in the final on December 12, 2014 against Rose Namajunas. Esparza won the fight, submitting Namjunas via rear-naked choke in the third round. The result also earned Esparza a Performance of the Night bonus.